In the PuroTrader office, we're constantly looking for ways to enhance our (and your) smoking experience. We believe that fine cigars can be a culinary experience on par with wines, scotch, and prestigious dining. We've brought you pairings of cigars and wine, even cigars and vodka. But when it comes to food, we struggle to find that perfect, go-to cigar pairing. We all know that wine and cheese are a match made in heaven, but what about our beloved figurados? The Fuente family is ahead of the times yet again, and not just for the amazing cigar productions. They're setting a new bar for classic pairings: cigars and chocolate. 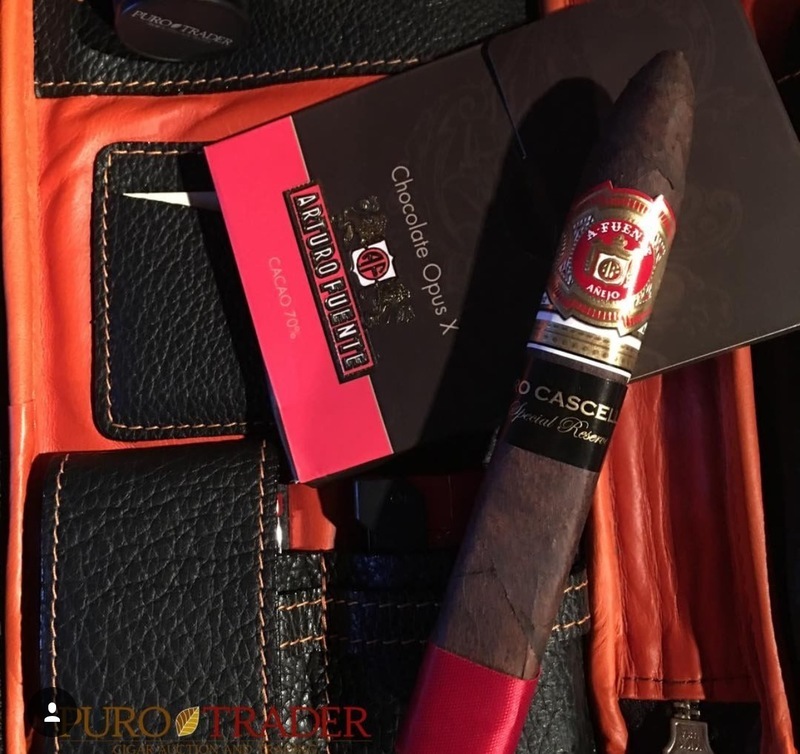 We're having the pleasure of pairing the Fuente Añejo Shark Ciro Cascella Special Reserva with Fuente Opus X Chocolate, organic dark chocolates designed to be paired with specially blended cigars. This is a good day at work. This cigar is a perfectly made box-pressed maduro torpedo. The even and consistent draw has a slight pull, and the flavor begs you to smoke more! There's a hint of chili pepper heat tempered by a sweet espresso backdrop. The presentation of the chocolate bar matches the crasftmanship of this killer cigar. The satin finished package, the Fuente family seal, the Opus X logo embossed on the bar itself, all perfection. By only using organic cocoa beans, Fuente has created a chocolate of above average quality. The only chocolatey downside? It's quite hard and requires some oomph to bite through. But pairing the chocolate with the bold finish of the cigar is a fantastic exercise; the dark cocoa covers the palette with sweet richness that the smoke digs into. Throughout enjoying this little gem, the flavor intensity continues to swell. As the pepper in the cigar intesifies the chocolate keeps it in check, and an enjoyable battle for flavor dominance ensues. I would definitely recommend this experience and pairing, to those who have tried dark chocolate with cigars and those who have not. This particular chocolate and cigar combo are not currently in regular production, I was lucky enough to snag a few from Carlito Fuente himself, so it would be difficult to say when this exact pairing will be available at a lounge near you. But I am extremely excited to see what other brands join this next stage in cigar experience, moving into the culinary arena. Well done Fuente for pushing through to the next level!